This is the twentieth installment of the monthly classic actress beauty tips that I have read about and tested. Jane Powell in 1954. Had a great figure then and still does! Since the holidays are over (no more sweets and heavy foods to slow me down) I’m ready to start exercising even more. From past posts, many of you know I’m partial to Jane Fonda exercises, along with contemporary workouts like Jillian Michaels. But recently I’ve been trying to find new exercises. 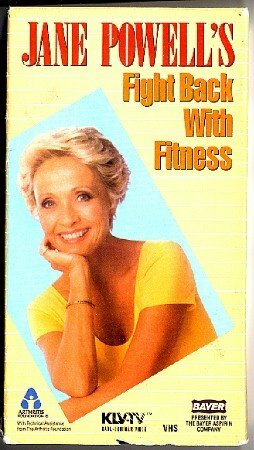 Keeping in tune with my 1980s Jane Fonda workouts, I’ve had my eye on an exercise tape actress and singer Jane Powell released in 1986 called “Jane Powell’s Fight Back With Fitness.” After letting it sit in Ebay watch list for months, I finally bought it last week for $6. The exercises are for people with arthritis. I knew this when I bought the tape, but I still was interested in watching the tape and figured some of the exercises could still work for me. Well….I was a little wrong. The first 24 minutes of the video is breathing and stretching and the last 22 minutes consist of some floor work. I mainly just watched the warm up portion because the exercises weren’t really for me. For example, some of the exercises involve touching each finger to your thumb, or breathing deeply and stretching your arms up to open your ribcage. While I didn’t participate the whole time, I could tell that these would actually be very good exercises for someone with joint problems. I did join in for leg and stomach exercises during the 22 minutes of floor work. While Jane Powell only did five slow reps, I would pause the tape and do several more. Aside from exercises that weren’t appropriate for my physical level, it was a really fun work out tape. Jane Powell in her 1986 video. Jane is adorable and sometimes counts in a sing songy voice, so we get just a taste of her operatic voice. She wears a bright, sunny yellow leotard and is very sweet to the people exercising with her-understand their limitations and complimenting them the whole time. To review: For those who are looking for an exercise video to get ripped and toned, this isn’t for you. But for a film fan who wants to see one of their favorite musical stars in another medium, it is a lot of fun. Jane Powell is 57 in this video and looks wonderful-and looks great today as well! I think it’s good that she did a workout video taking into consideration that some people aren’t able to do more strenuous exercises. Check back for February’s beauty tip! This entry was posted in Beauty Tips and tagged beauty tips, exercise for arthritis, Fight Back with Fitness, Jane Powell, Jane Powell Exercise by Jnpickens. Bookmark the permalink. I love Jane Powell. She looks great in the video picture! When she made this video she was 57. I am 56 and have never looked like that! REGARDING THE JANE POWELL WORKOUT TAPE…..I WILL BUY IT CUZ I AM 73 AND HAVE ARTHRITIS….JANE WILL TURN 83 THIS APRIL AND LOOKS FANTASTIC….SAW HER LAST YEAR AT THE HOLLYWOOD BOWL……I HAVE BEEN A FAN OF HERS JUST ABOUT ALL OF MY LIFE…..
You’ve done 20 of these? Wow–impressive. I think a lot of people will never look as good as Powell did in that video, regardless of their age.